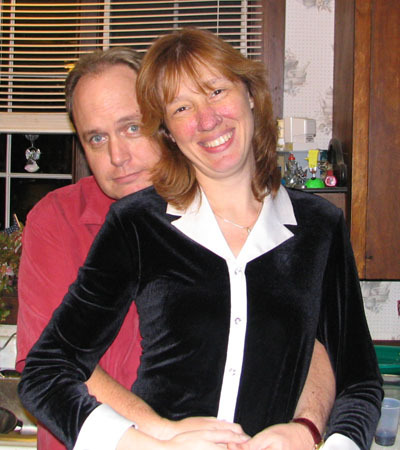 Lisa and Pat are the people behind the website. We were married in 1998, and the TSCTalkers from that time were a very big part of our wedding. It was amazing! We still have all the poems counting down the days and the virtual Chip-n-Dip sets we received - simply wonderful! What a great little family we had. The TSCTalk Mailing List went away for a few years, but Pat and I are back now and hope to see everyone at some point. We've missed you all! Since we've been gone, my seizures have been completely controlled and I have gotten my drivers license. I have a great job and am in College. We still have a house full of animals (Aura is still here, and we now have a new hound-sharpeii mix named Miss Moo - she looks like a cow. In addition, we have Fluff and Lulu, the felines). Jen is on her own now and doing good, though there are many challenges. I'm thrilled to be back and can't wait to hear from everyone!